Yes, you can Ballroom Dance! Whether you are inspired by the latest sure-footed dance or want to look beautiful at your wedding, sigining up for ballroom dance is a great way to get started. Not only will you learn a little bit about the history of ballroom dancing, but you'll learn the steps to dance with confidence. Let InMotion Dance Academy's ballroom dance instructor, Ed Birdsall, guide you around the dance floor! 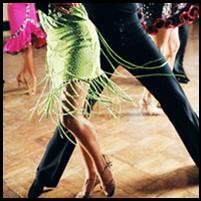 Learn some basic steps from The Waltz, The Foxtrot, and The Swing! Please wear comfortable clothing and rubber soled shoes. This class is great for anyone who has always wanted to learn ballroom dance!